Urban vehicle dwelling is a relatively new phenomenon that is growing, particularly in Bristol where housing affordability has been negatively impacted by a persistent shortage in housing. 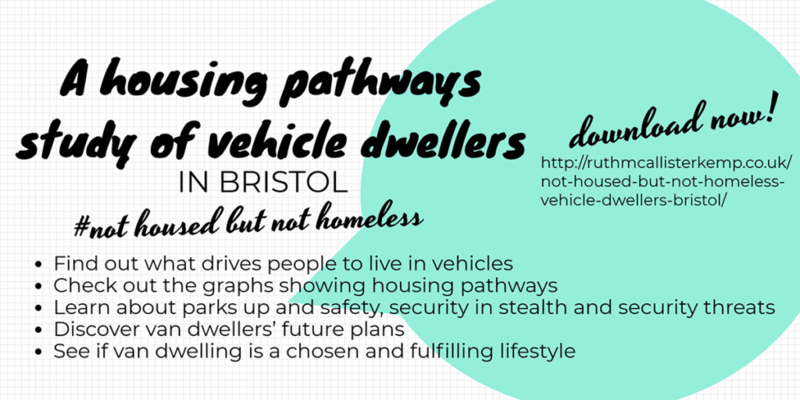 This unique research examines the complex reasons behind van dwelling in Bristol, with a particular focus on people who live in mobile vehicles (not stationary caravans). Read about how a van dweller’s vehicle is a crucial possession and why vehicle dwellers feel liberated from ‘stuff’, plus their reluctance to self-identify and the ‘van dweller’ term. Discover how van dwelling can be a chosen and fulfilling lifestyle. Learn about parks up and safety, security in stealth and threats to security. Find out about van dwellers’ future plans and happiness. You’ll find graphical representations to illustrate the diversity of pathways into vehicle dwelling. They range from being relatively simple with few moves in or between normative and non-normative housing, to more complex pathways in and between the two types. You’ll find detailed discussions on how each of those factors influence van dwelling in Bristol. You’ll also discover how self-efficacy leads to the self-provision of housing. Is vehicle dwelling a choice? Delve into whether vehicle dwelling is actively pursued. Is it a goal in itself? Or does it help people transition to a future ideal living situation? What’s the point of this research? Estimates of lived-in vehicles parked on Bristol roads began only in 2017. The number of people living in vehicles on roads in Bristol has risen from 90 to 120 – an increase of 33% from 2017 to 2018. Importantly, this estimate may not include stealth vans. This research is not an attempt to describe vehicle living, nor an attempt to discuss the problems caused by vehicle living (or, indeed, the solutions provided by vehicle living). While the housing shortage in Bristol persists and the number of people living in vehicles continues to grow, research into van dwelling is vital to inform the development of local authority policy. Know someone who’s interested in urban van dwelling? Share this page.